Tom Hamilton’s Mighty High Picks! We’re thrilled to celebrate Jerry’s 76th birthday this year at Mighty High: 2 Nights in Vail, CO with the Jerry Garcia Birthday Band! To prepare for the occasion, Tom Hamilton has shared some of his favorite Dead tunes through the years. You might recognize Tom from his work with Joe Russo’s Almost Kid, Phil Lesh & Friends, Billy & The Kids, and more and we are stoked to see him back in action with the JGBB. 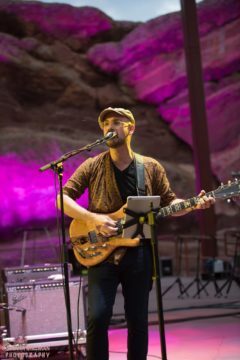 If last year’s Red Rocks show is any indication, we are in for a treat in Vail! Enjoy a playlist of the tracks on YouTube and Spotify along with commentary below. First of all, I’m a sucker for a balled. And for me, Garcia is untouched when it comes to them. This particular cut checks off all of the things that made him so great. The intimacy of his vocal delivery brings you right next to him and shrinks the room down to being just the two of us. The solo he takes can only be described as vulnerable, which in of itself is a feat in guitar playing. The first recorded music that was ever “mine” was a cassette tape of the Grateful Dead playing at Red Rocks in 1978 that I got from my dad when I was four. One of my earliest memories, not just musically but in general, is of listening to this concert. The silly joke Bob tells at the beginning, to the Werewolves of London at the end. But the thing that hits hardest is the Terrapin. There’s such pep in Garcia’s playing and singing through this entire concert and set the bar pretty high for me from a very young age as to what a guitarist can do. 35 years later, it’s still my favorite. This show was the evening that I was born. 12/31/78. I had the concert poster on my bedroom wall for my entire childhood, and I listened to this cut on cassette hundreds of times as a kid. The way Garcia grabs the band and brings them to Fire on the Mountain was the first time I really thought about connecting two songs through a jam. By 1989, I really wanted to go to a Dead show. My folks let my older brother start going a couple of years before, and as a 10 year old, I was pushing them hard. Word got out in the news that JFK was was falling apart and the city was actually considering cancelling the show. This didn’t help my case. My dad and brother went to the show. Six days later the city condemned the building. Thank god they let it happen, because this version of Wharf Rat was a huge inspiration through my teen years. After a brief hiatus from the Dead’s music in my early teens to focus on the guitar work of Randy Rhodes, Stevie Ray, and Van Halen, my brother showed up with the One From The Vault cassette. It was a game changer. The entire band plays wonderfully, but Garcia really ties the room together.